Historical Christ researcher David Strauss and Godfrey Higgins with his Anacalypsis (1836), arguing that the Hindus, Jews and Greeks in essence had the same myths, which were corrupted by Christians, were its pioneers. 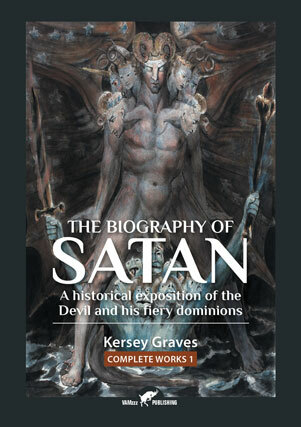 After Higgins, the Christ myth theory culminates in Kersey Graves, and in 1875 he publishes this book, destined to become the most influential and controversial work in this line of thought, up to this day. Many have been inspired (and annoyed) by his flaming argumentation and exhaustive detection of biblical flaws and errors. Among the authors he influenced was bestseller author Dan Brown, who apparently used The World’s Sixteen Crucified Saviors as a source, investing Mithra, while writing The Da Vinci Code. 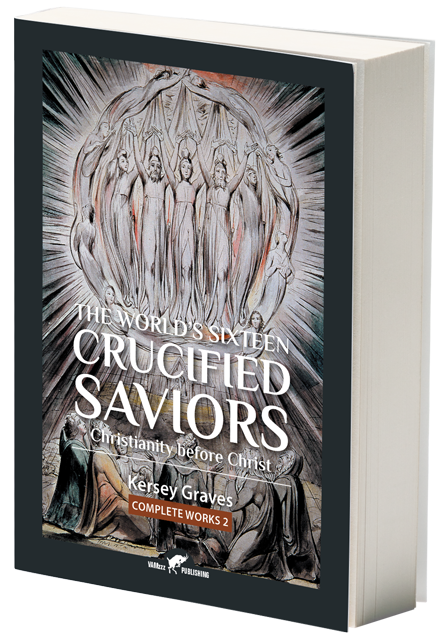 While one must critically put Kersey Graves in the historical context of his own time, as well as the validity of his claims, The World’s Sixteen Crucified Saviors remains an explosive work. 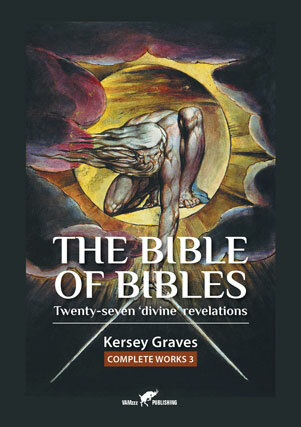 The Bible of Bibles is a partial philosophical, social and historical treatment on the nature God and the Bible and it’s many “predecessors”, like the sacred books of India and China. According to Graves, true religion does not regard God as a personal monarch, governing the universe by the caprices of an angry and fickle mind, but as the living, moving, all-pervading, self-sustaining, energizing, vivifying power which moves and sustains the machinery of the whole universe. Graves does not deny a divine force, but ridicules the assumption this force has a personality. Partially, by enumerating mistake after mistake made by many holy Biblical figures, including Jesus.